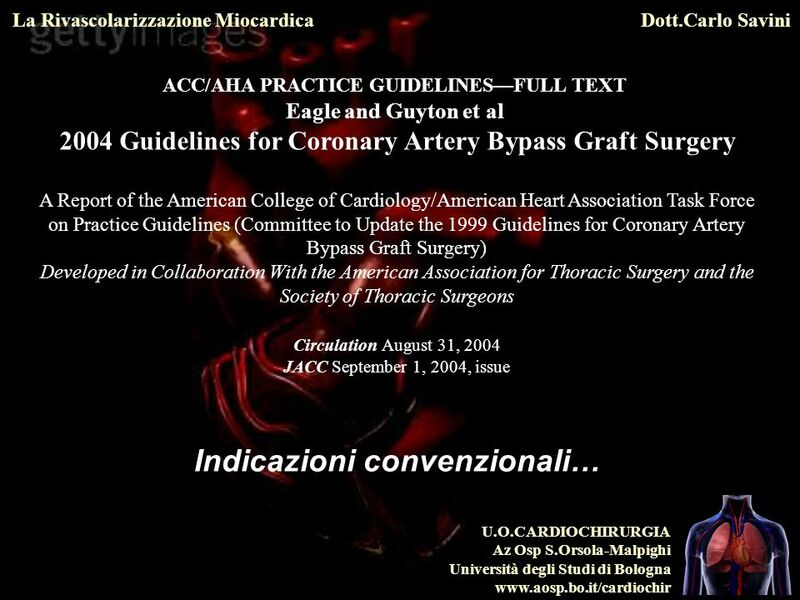 5 Hlatky MA et al. 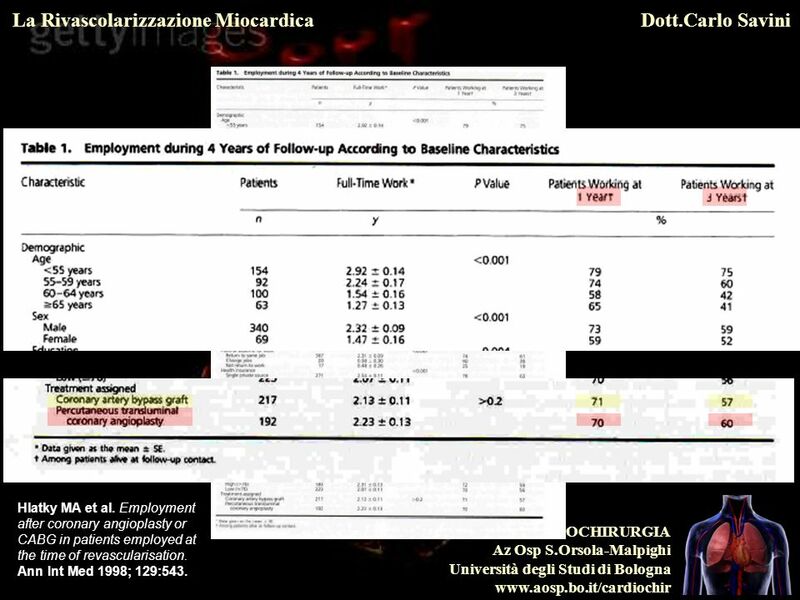 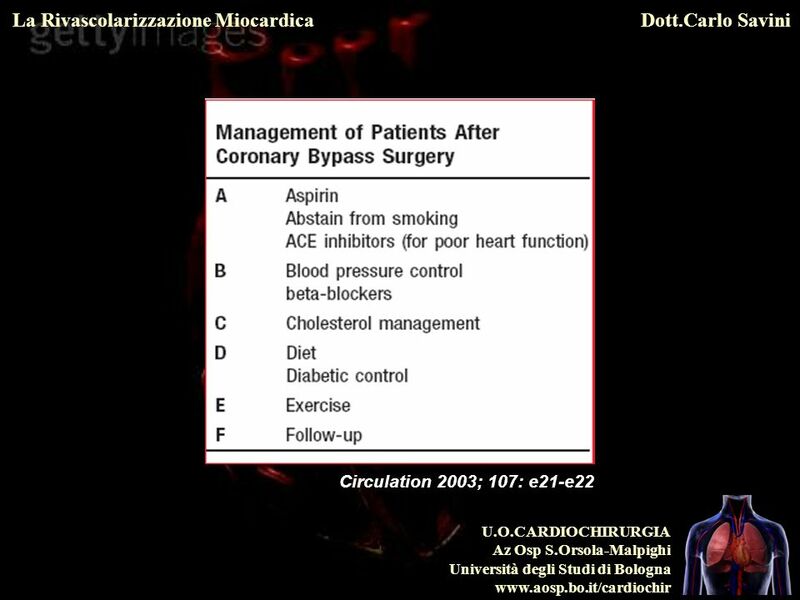 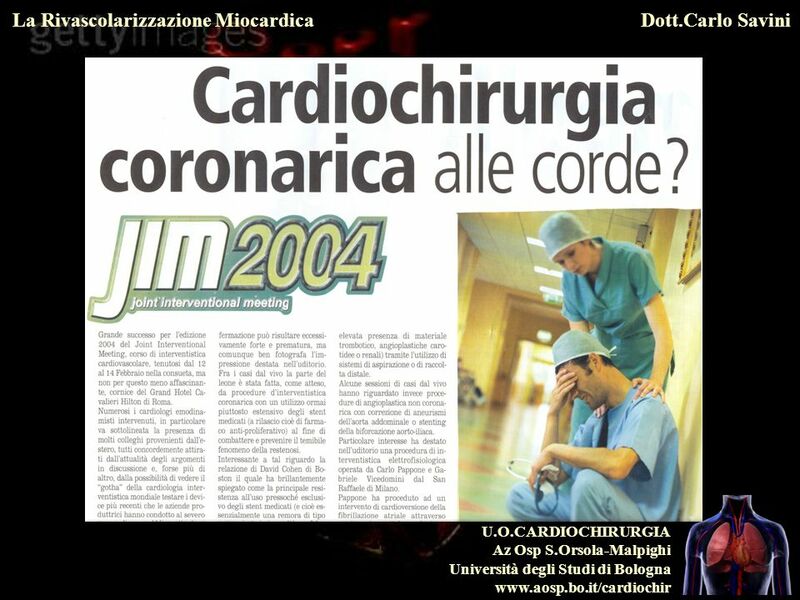 Employment after coronary angioplasty or CABG in patients employed at the time of revascularisation. 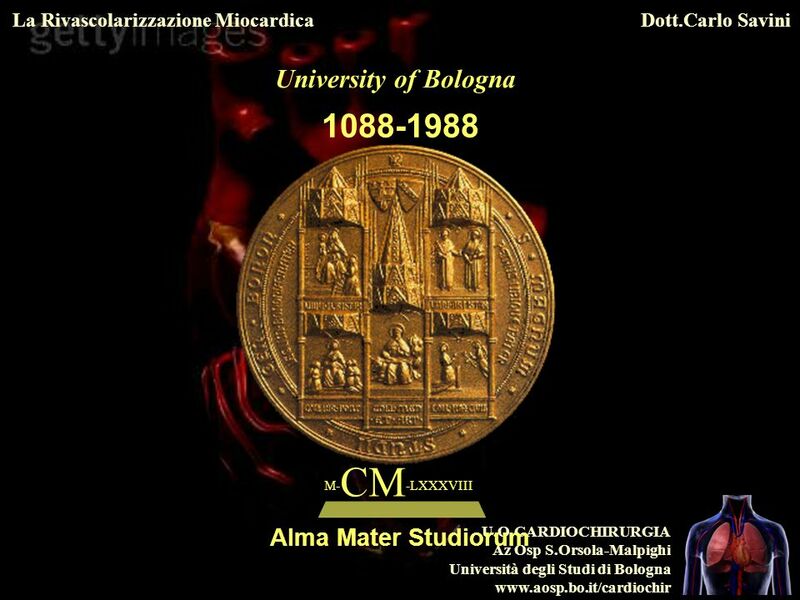 Ann Int Med 1998; 129:543. 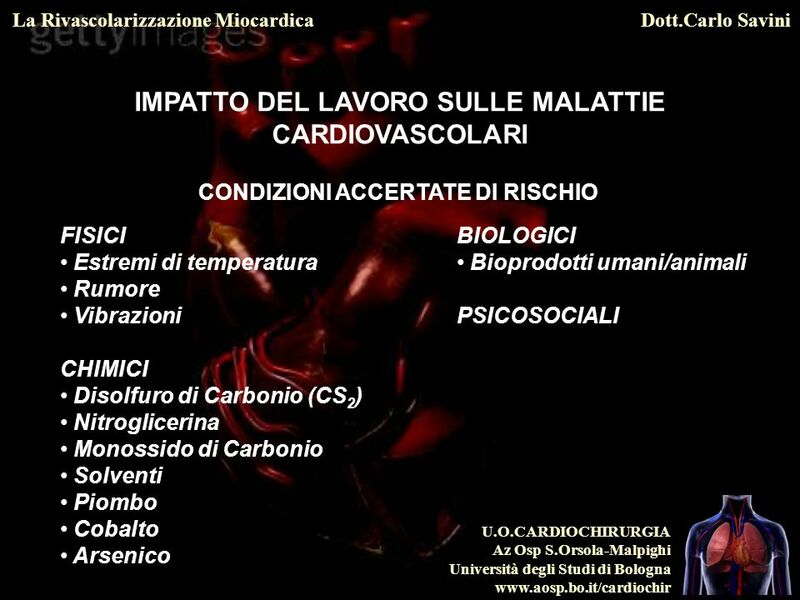 Class I 1. 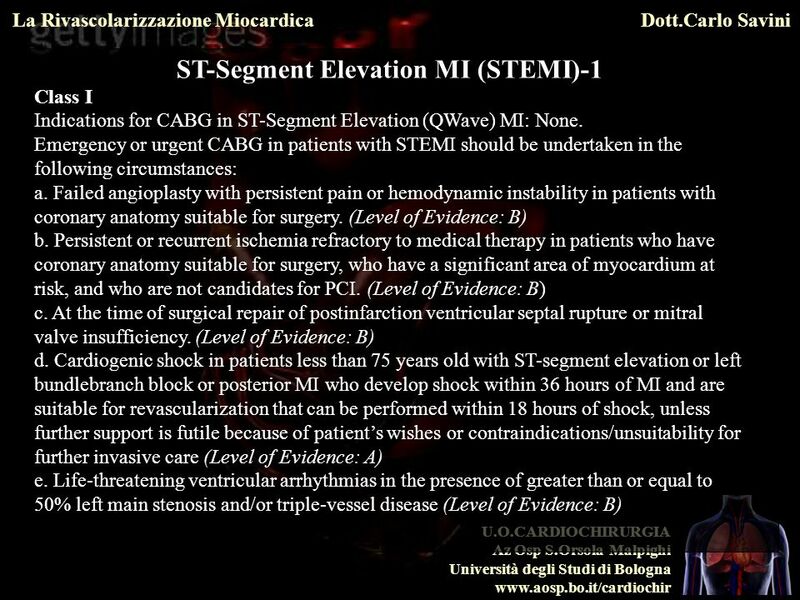 CABG should be performed in patients with asymptomatic or mild angina who have significant left main coronary artery stenosis. 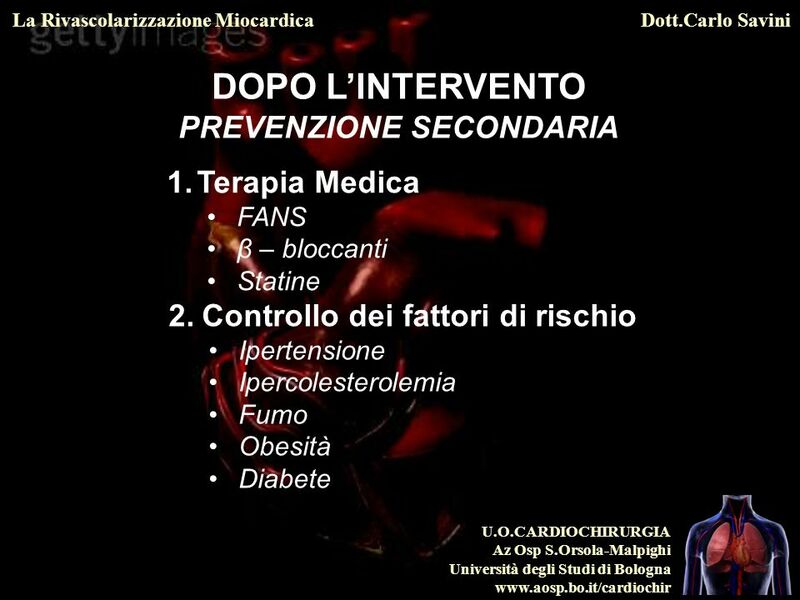 (Level of Evidence: A) 2. 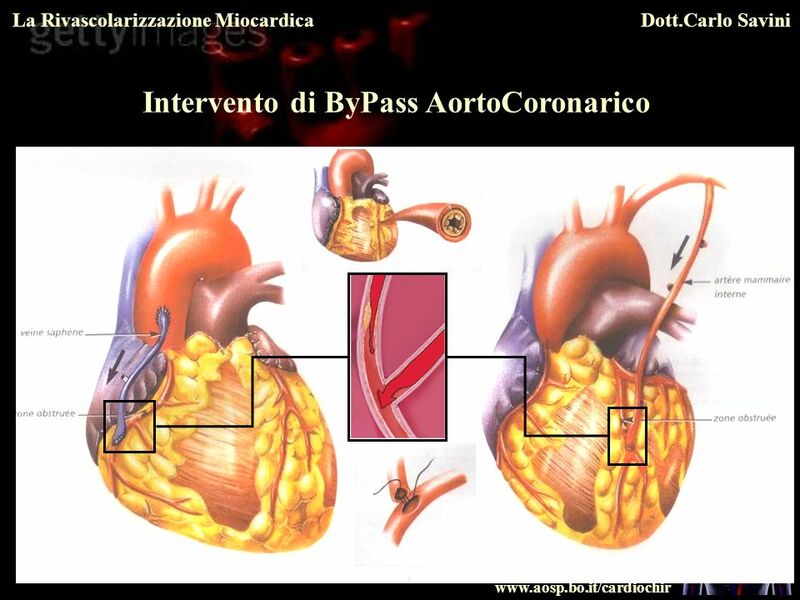 CABG should be performed in patients with asymptomatic or mild angina who have left main equivalent: significant (greater than or equal to 70%) stenosis of the proximal LAD and proximal left circumflex artery. 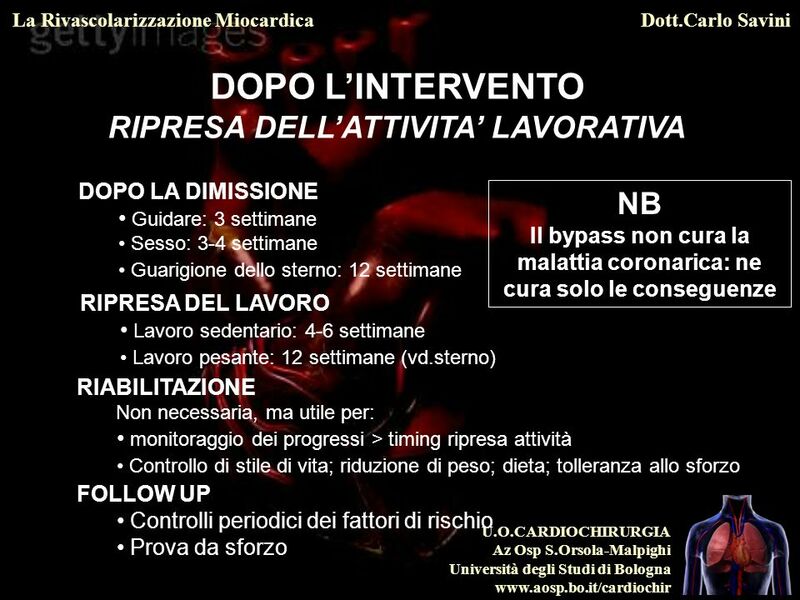 (Level of Evidence: A) 3. 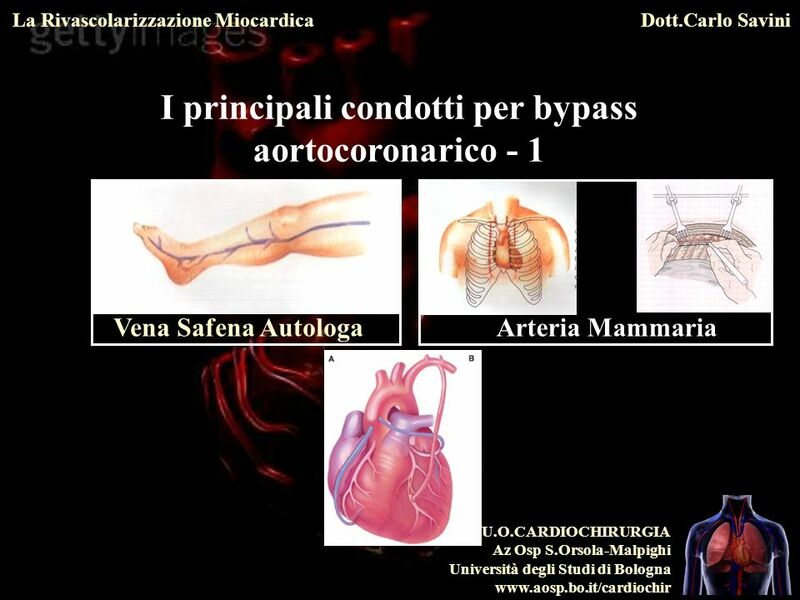 CABG is useful in patients with asymptomatic ischemia or mild angina who have 3-vessel disease. 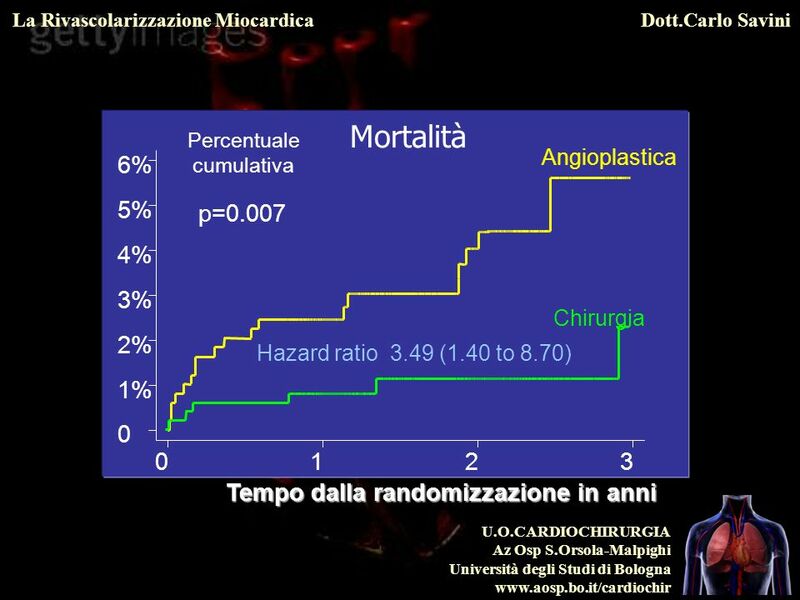 (Survival benefit is greater in patients with abnormal LV function; e.g., EF less than 0.50 and/or large areas of demonstrable myocardial ischemia.) 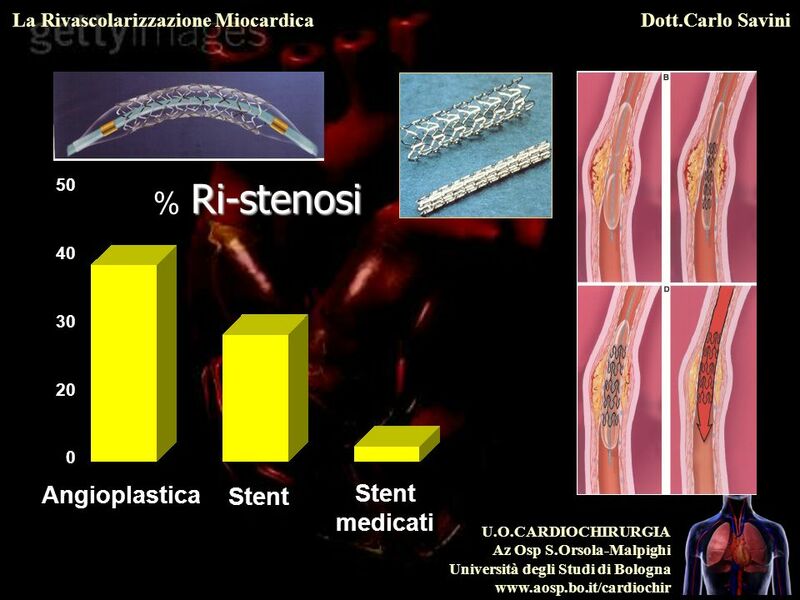 (Level of Evidence: C) Class IIa CABG can be beneficial for patients with asymptomatic or mild angina who have proximal LAD stenosis with 1- or 2-vessel disease. 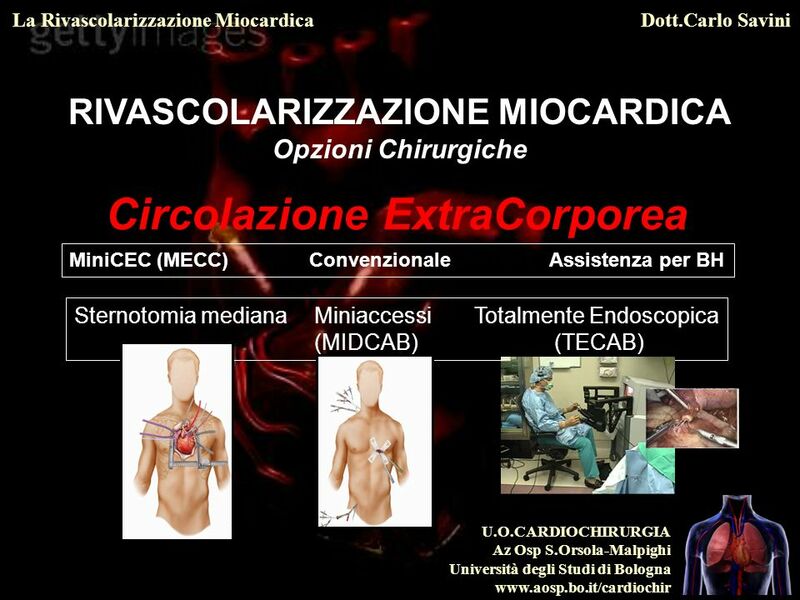 (This recommendation becomes a Class I if extensive ischemia is documented by noninvasive study and/or LVEF is less than 0.50.) 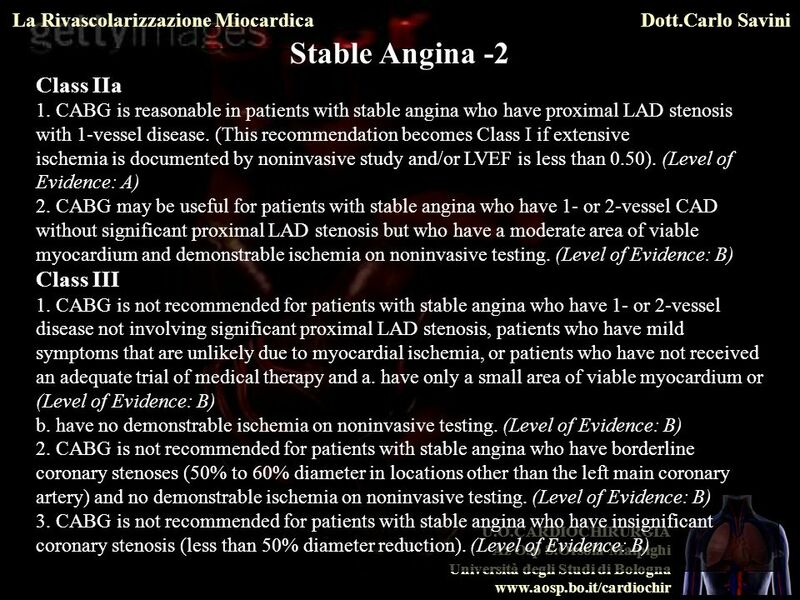 (Level of Evidence: A) Class IIb CABG may be considered for patients with asymptomatic or mild angina who have 1- or 2-vessel disease not involving the proximal LAD (If a large area of viable myocardium and high-risk criteria are met on non invasive testing, this recommendation becomes Class I). 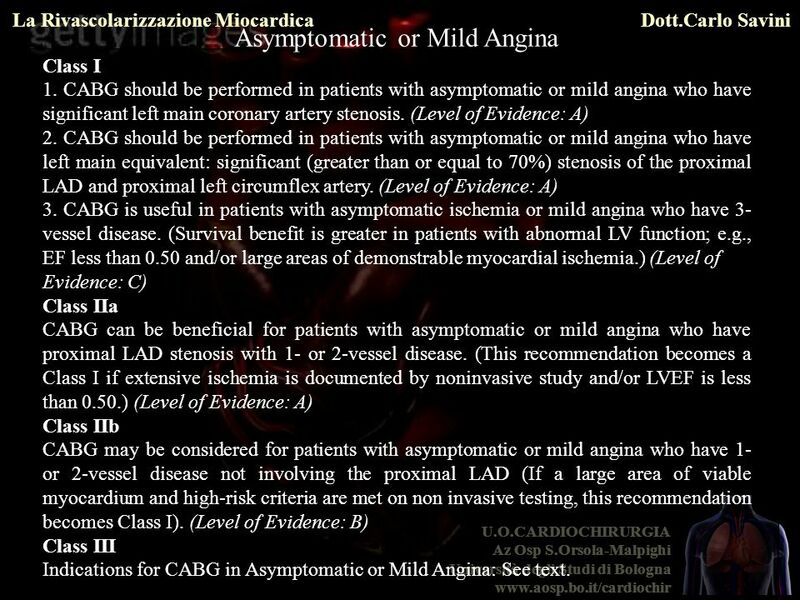 (Level of Evidence: B) Class III Indications for CABG in Asymptomatic or Mild Angina: See text. 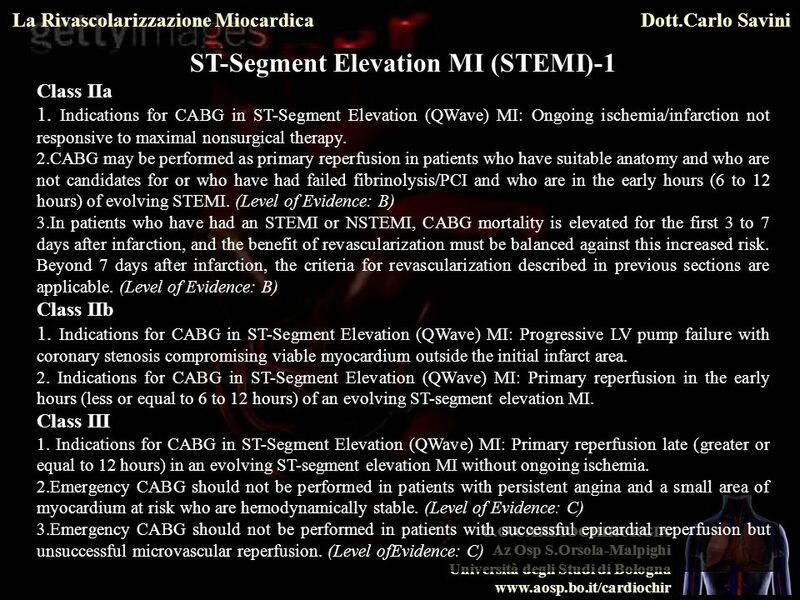 Elevation MI (NSTEMI) Class I 1. 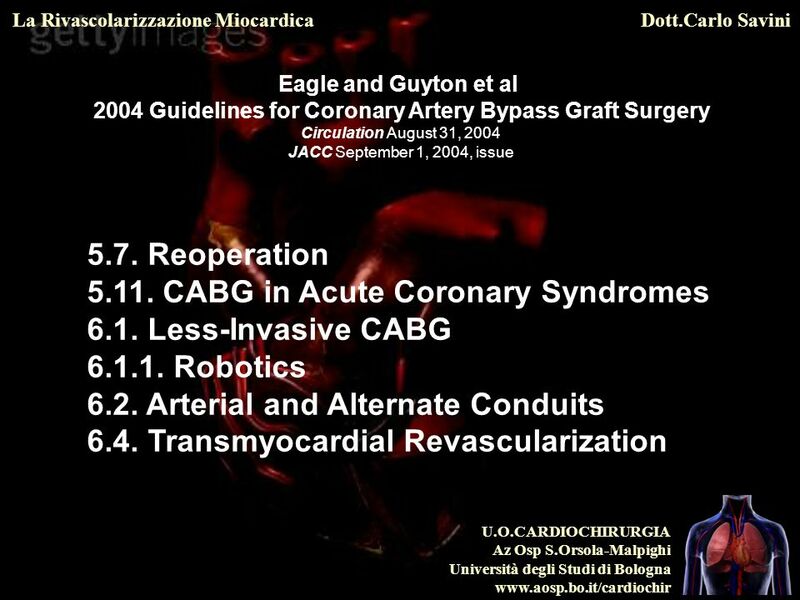 CABG should be performed for patients with unstable angina/NSTEMI with significant left main coronary artery stenosis. 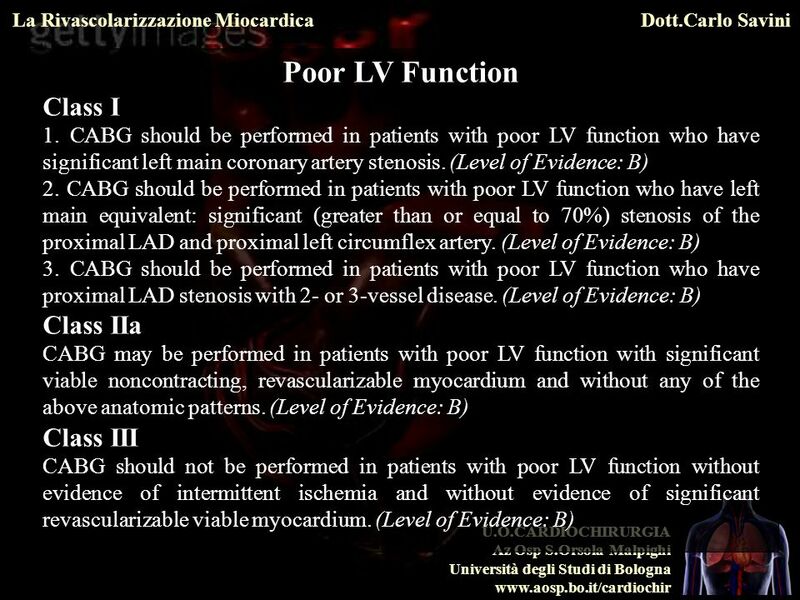 (Level of Evidence: A) 2. 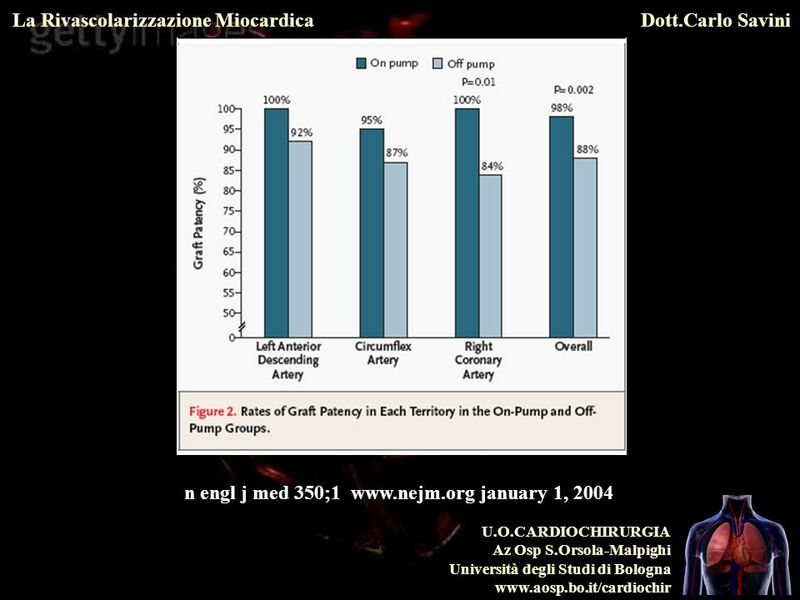 CABG should be performed for patients with unstable angina/NSTEMI who have left main equivalent: significant (greater than or equal to 70%) stenosis of the proximal LAD and proximal left circumflex artery. 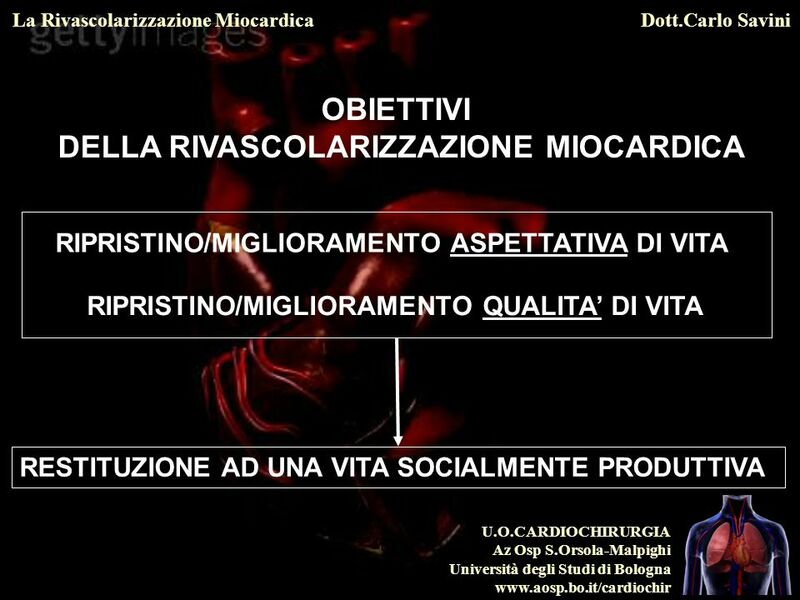 (Level of Evidence: A) 3. 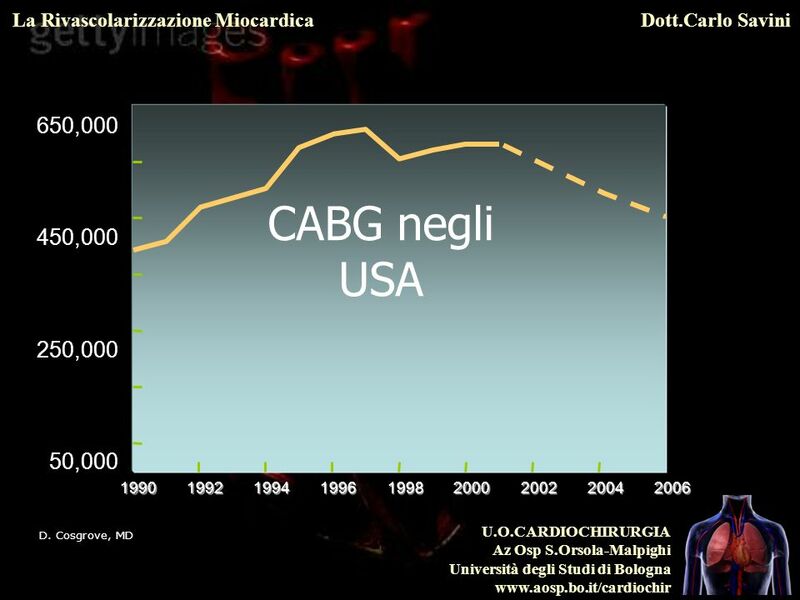 CABG is recommended for unstable angina/NSTEMI in patients in whom revascularization is not optimal or possible, and who have ongoing ischemia not responsive to maximal nonsurgical therapy. 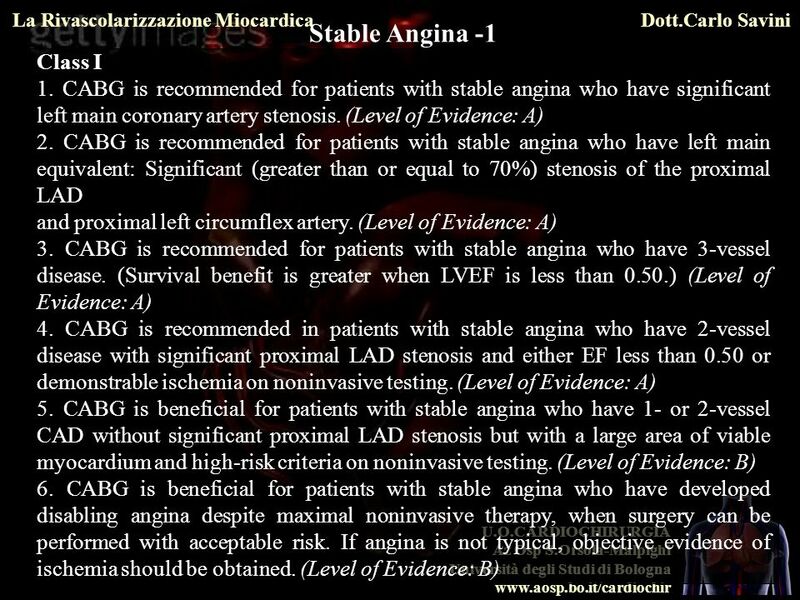 (Level of Evidence: B) Class IIa CABG is probably indicated for patients with unstable angina/NSTEMI who have proximal LAD stenosis with 1- or 2-vessel disease. 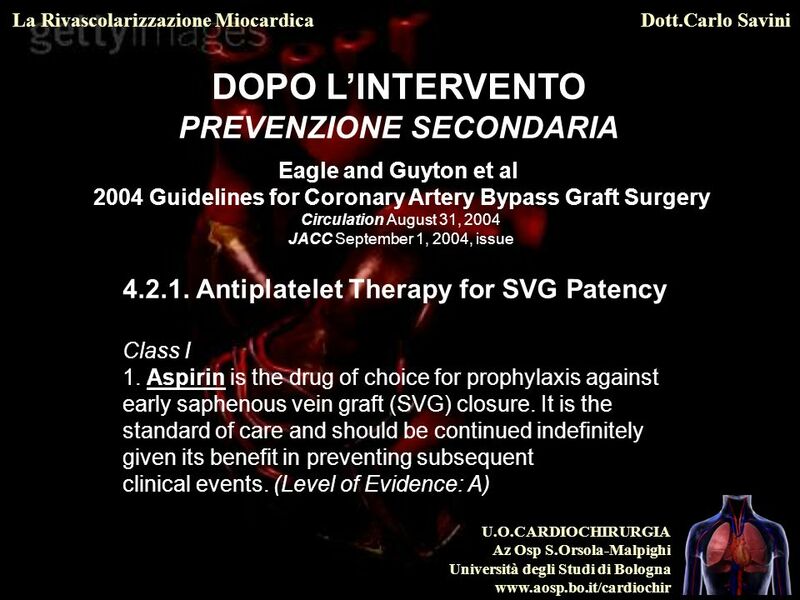 (Level of Evidence: A) Class IIb CABG may be considered in patients with unstable angina/NSTEMI who have 1- or 2-vessel disease not involving the proximal LAD when percutaneous revascularization is not optimal or possible. 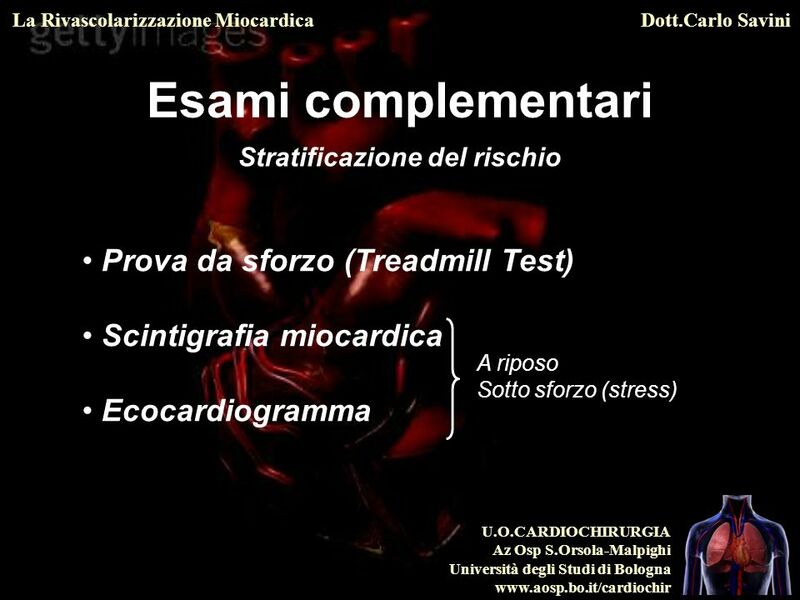 (If there is a large area of viable myocardium and high-risk criteria are met on noninvasive testing, this recommendation becomes Class I.) 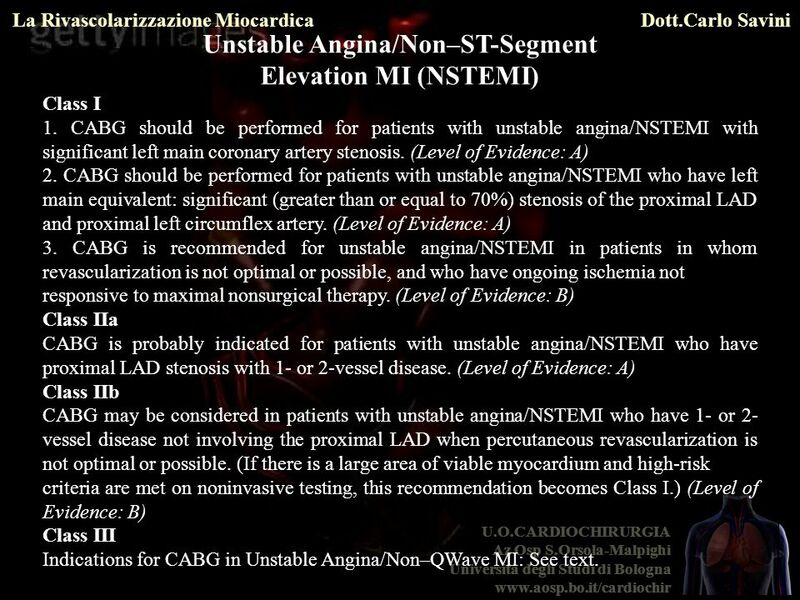 (Level of Evidence: B) Class III Indications for CABG in Unstable Angina/Non–QWave MI: See text. 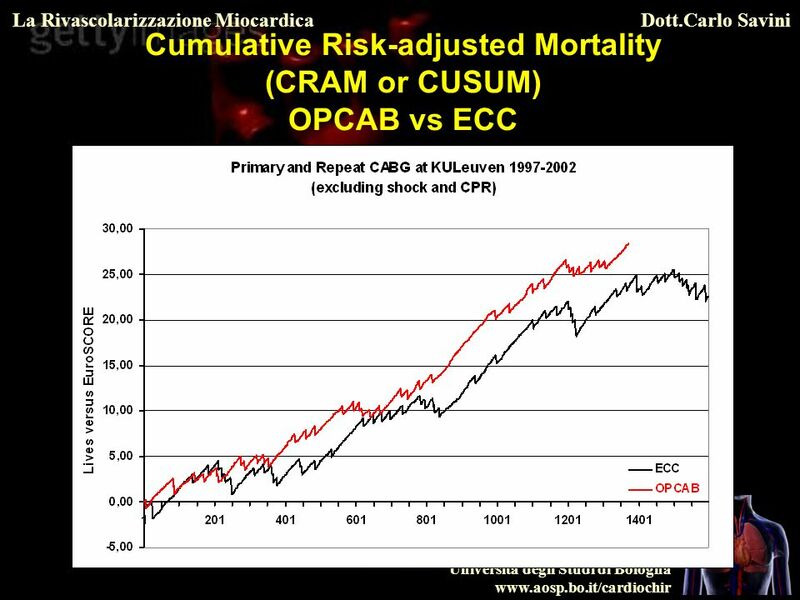 This is the cram plot of our patients on the ecc and opcab. 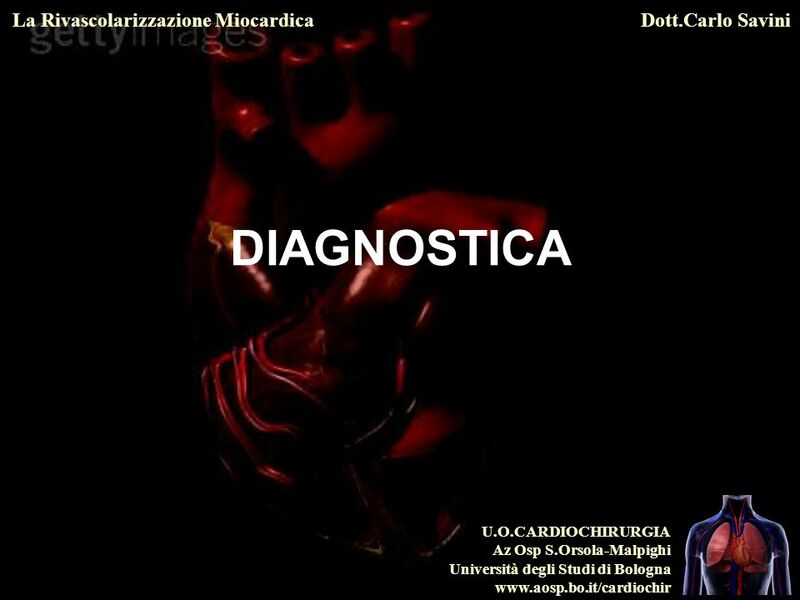 We have excluded for honesty versus the ecc (and therefore against the opcab) all patients in cardiogenic shock and cardiac massage. 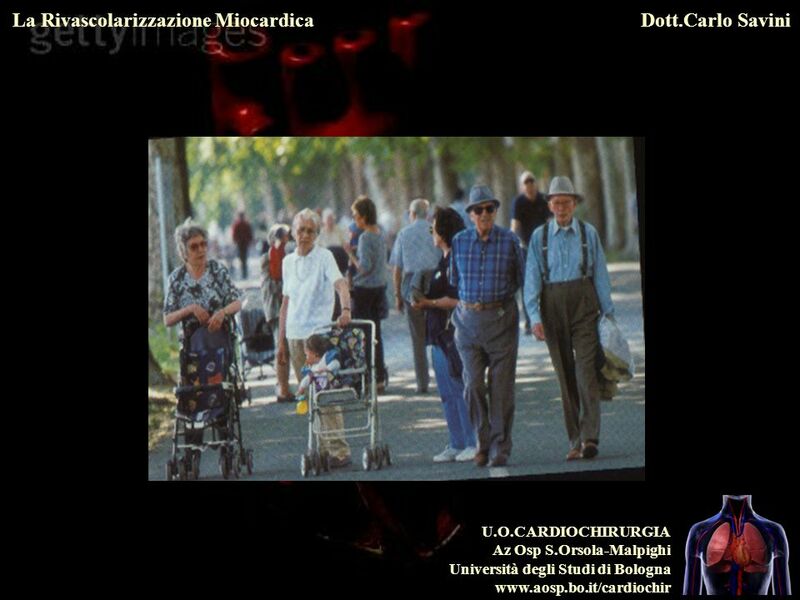 These are very badly scored in the euroscore and are all in the ecc group. 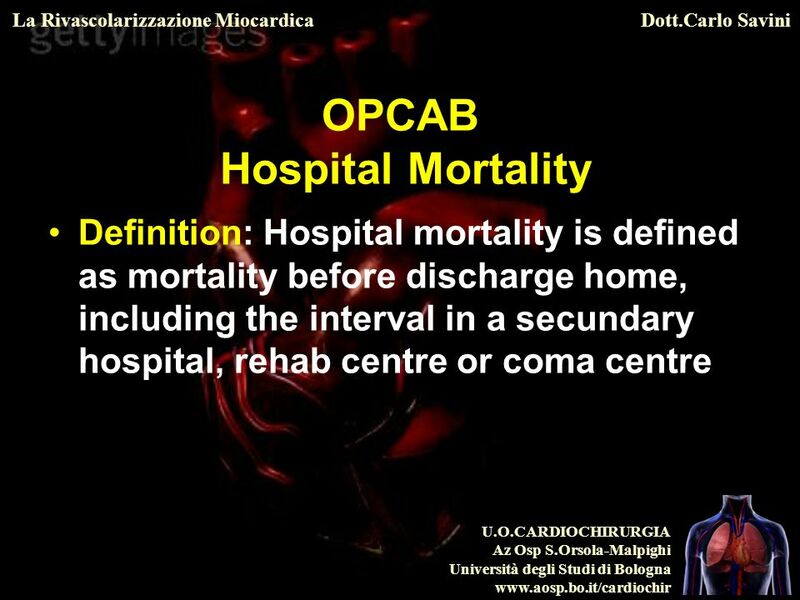 It is clear that the opcab is better versus ecc, certainly not worse, and this after correction for risk. 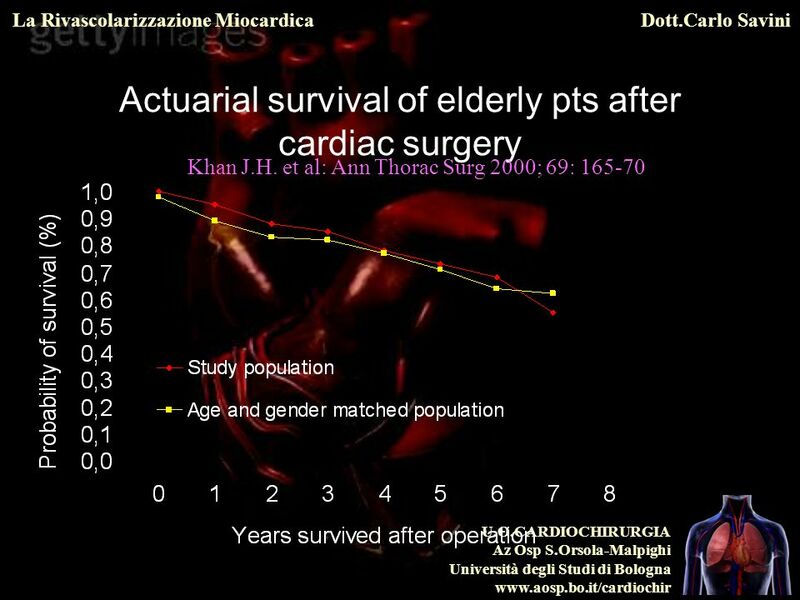 Later it will be identified that this difference is not yet (jan 2002 and 1200 patients opcab) statistically significant for mathematical reasons. 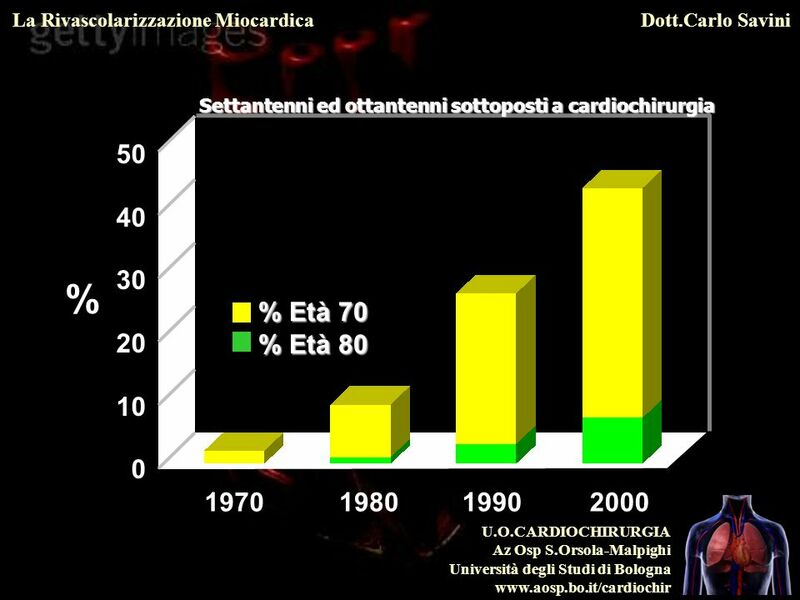 The sample sizes are not large enough for detection of 50 % reduction of risk with only 1000 patients and around 3 % mortality. 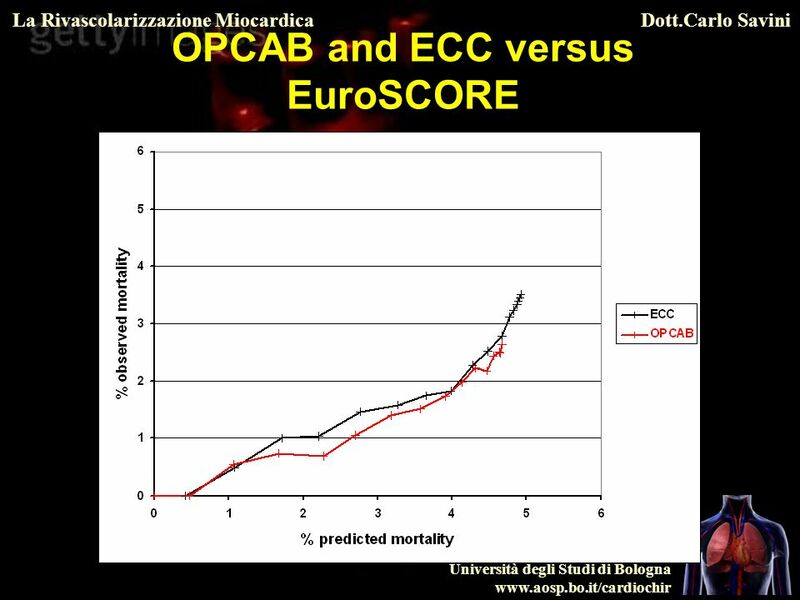 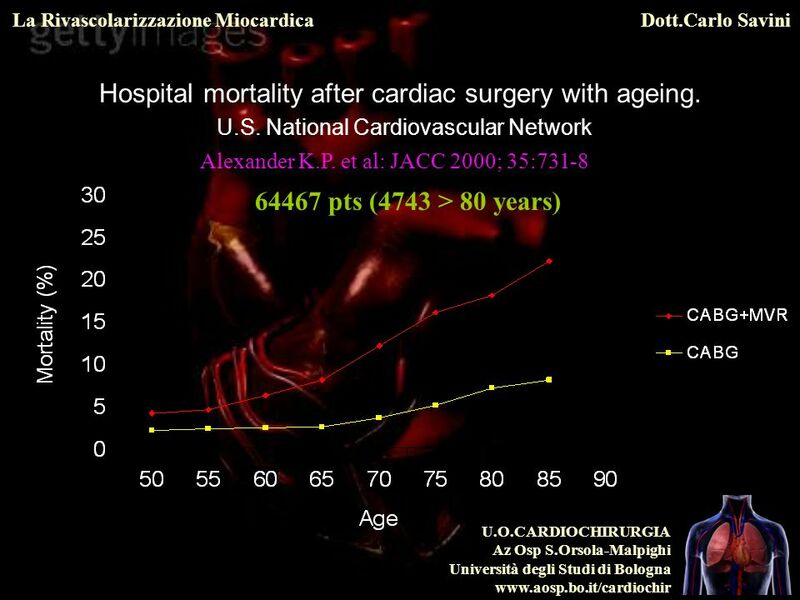 This graphic is valid for comparing ECC and OPCAB together versus EuroSCORE, only for the patients of paul sergeant. 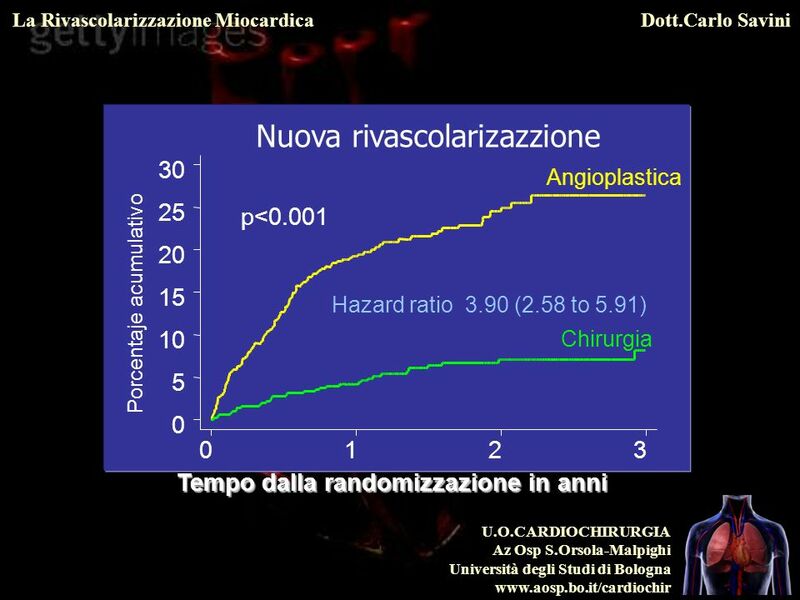 It is clear that the EuroSCORE risk has become totally invalid for OPCAB prediction of risk in the hands of an experienced OPCAB and CABG surgeon. 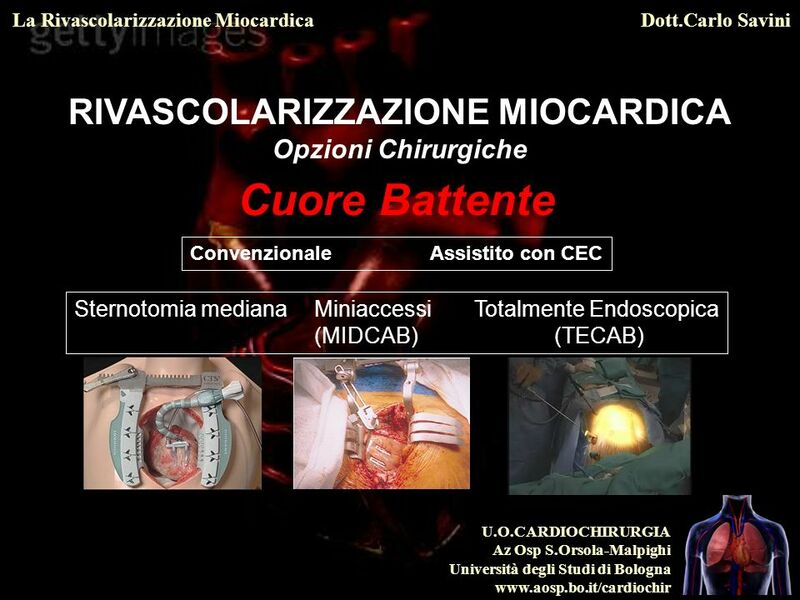 It is now possible to do cabg without any risk (nearly). 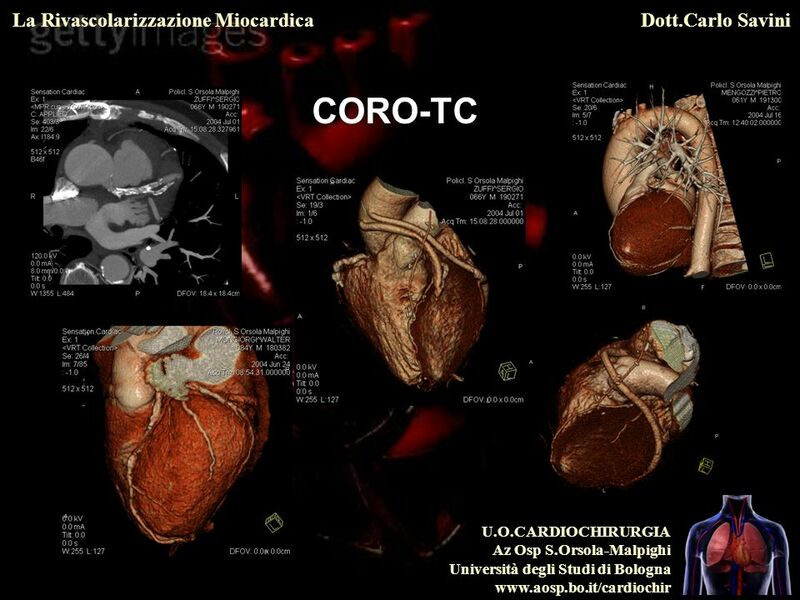 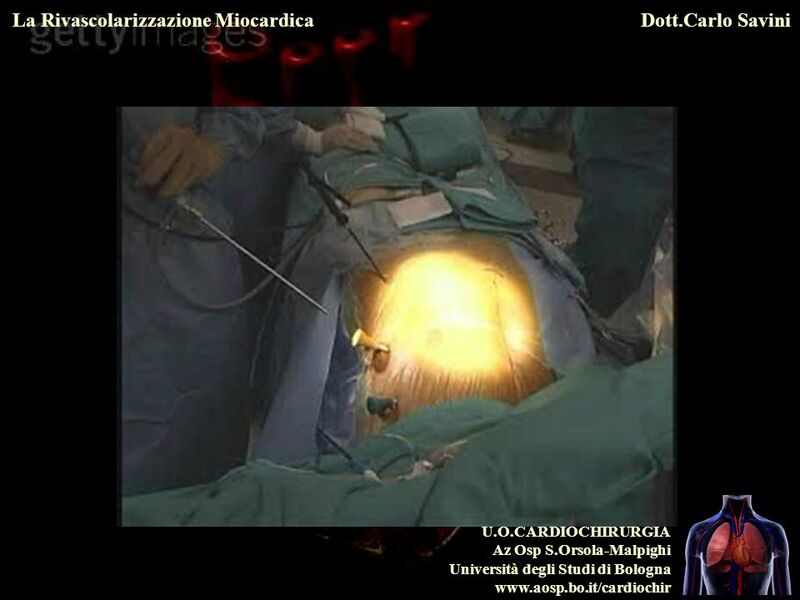 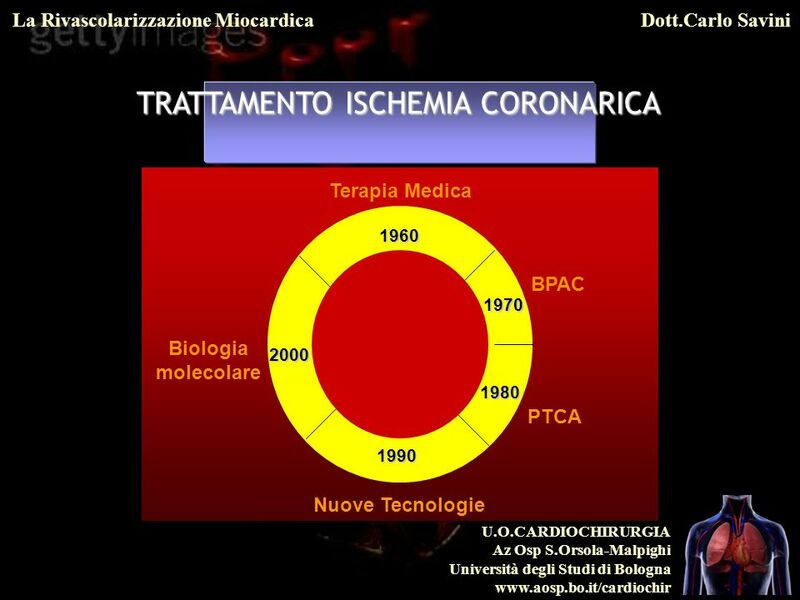 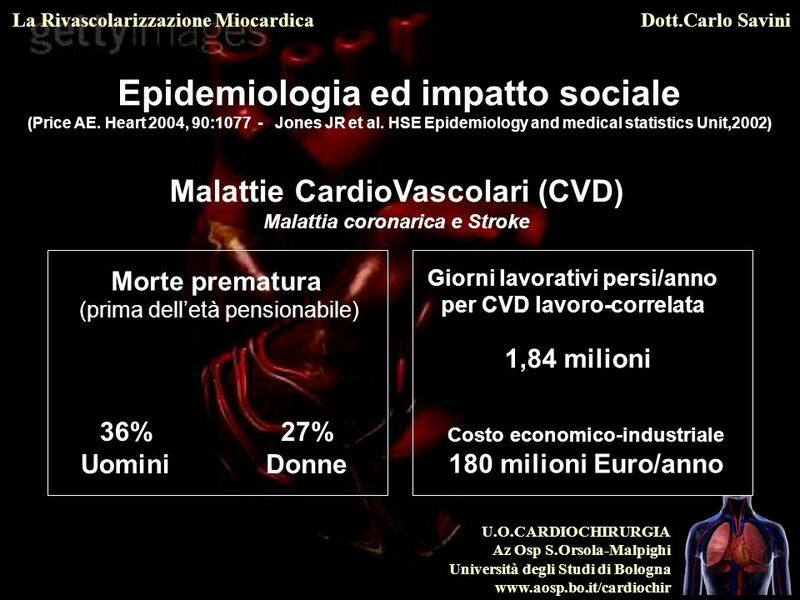 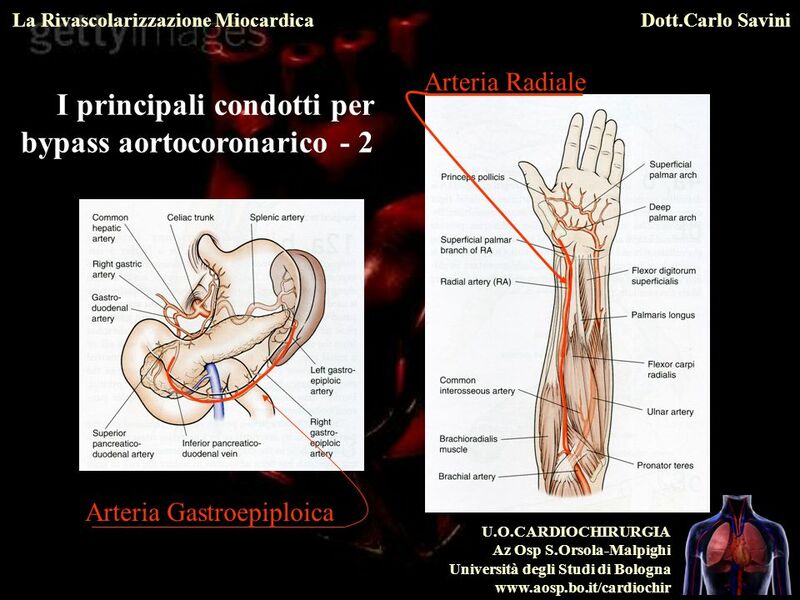 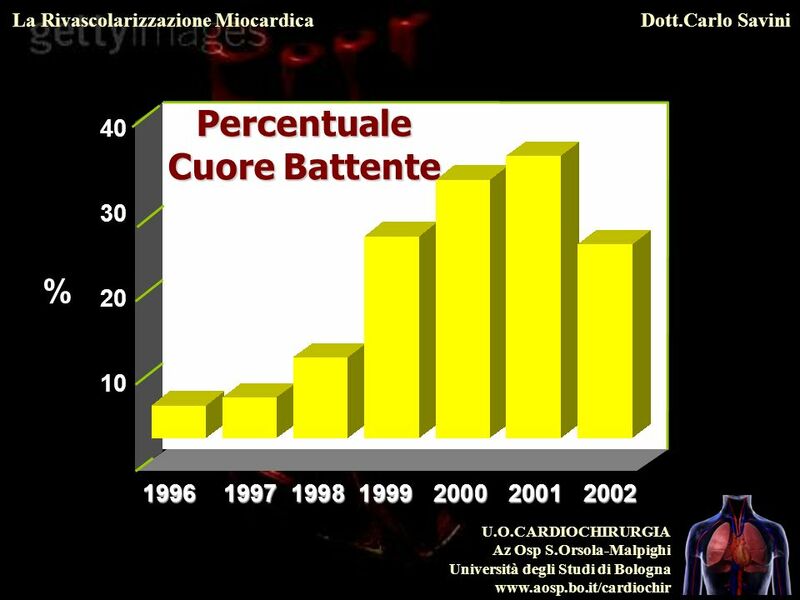 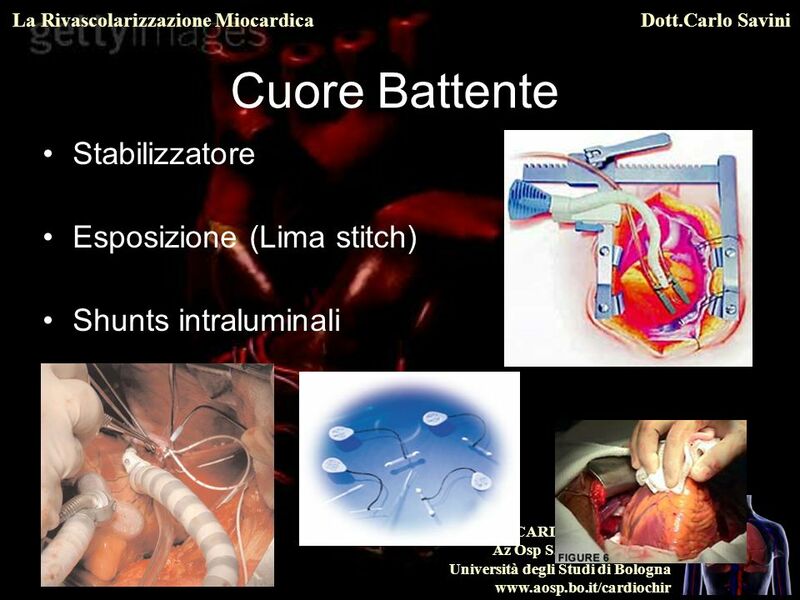 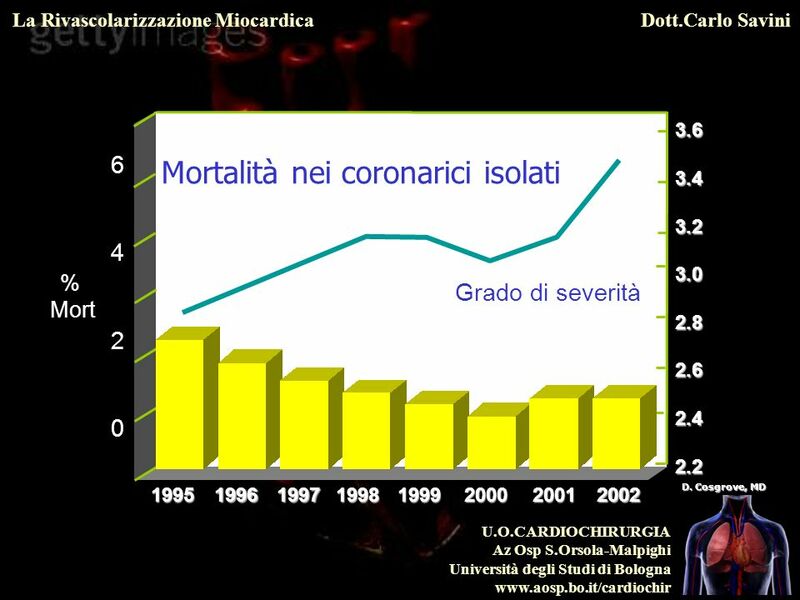 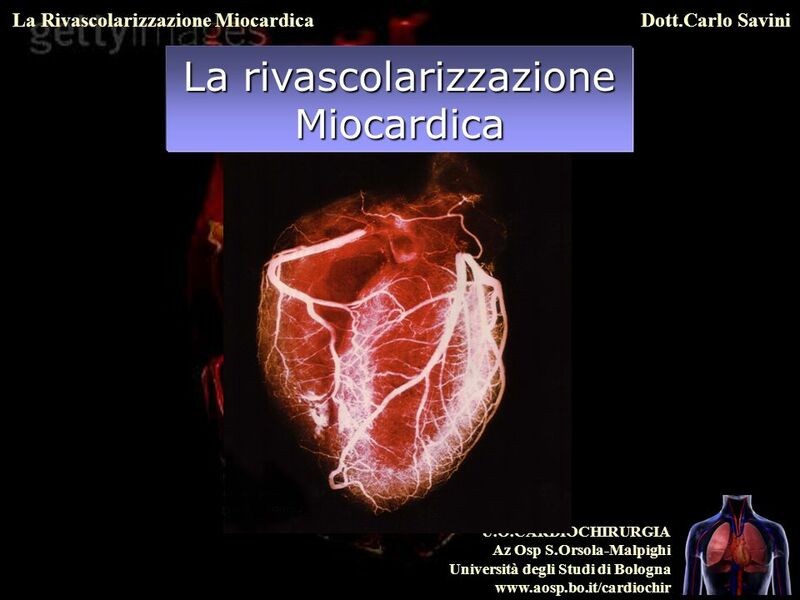 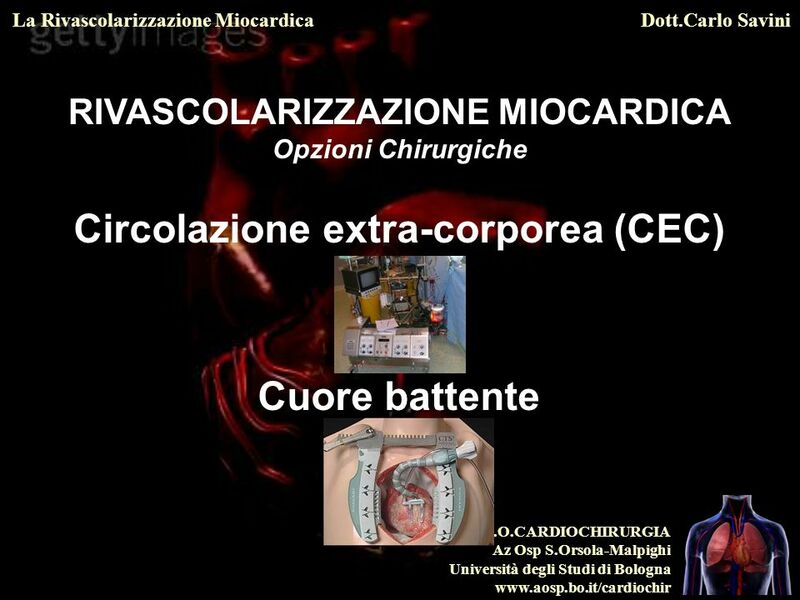 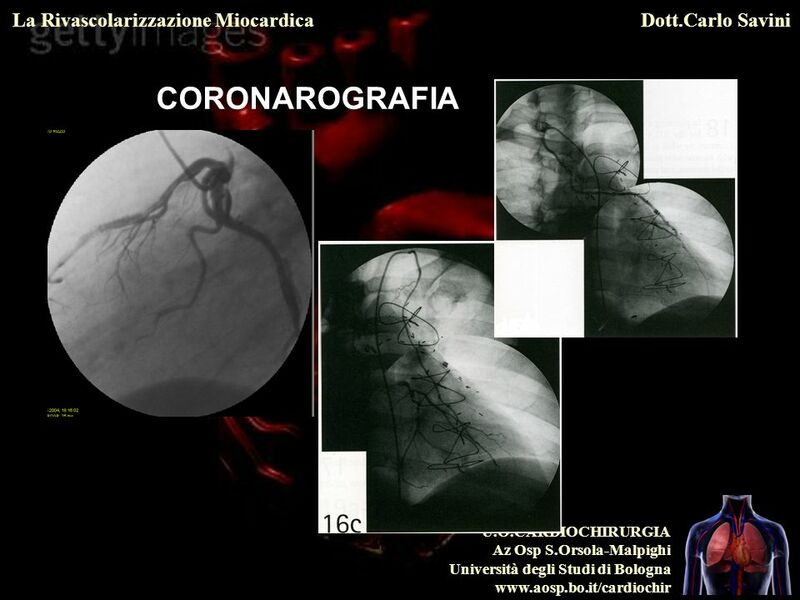 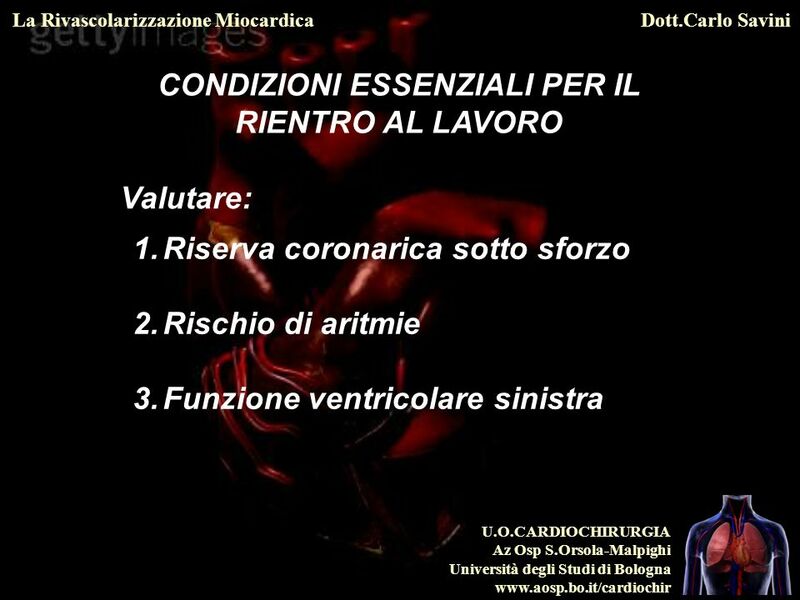 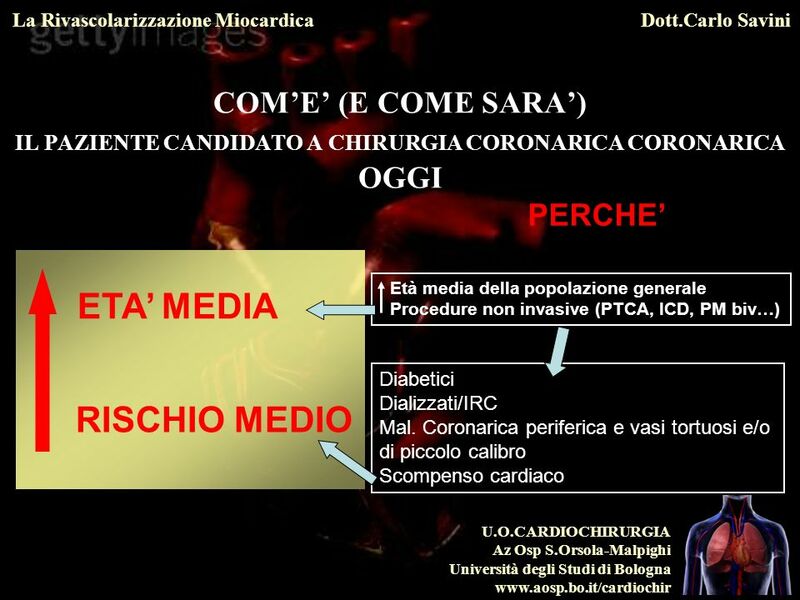 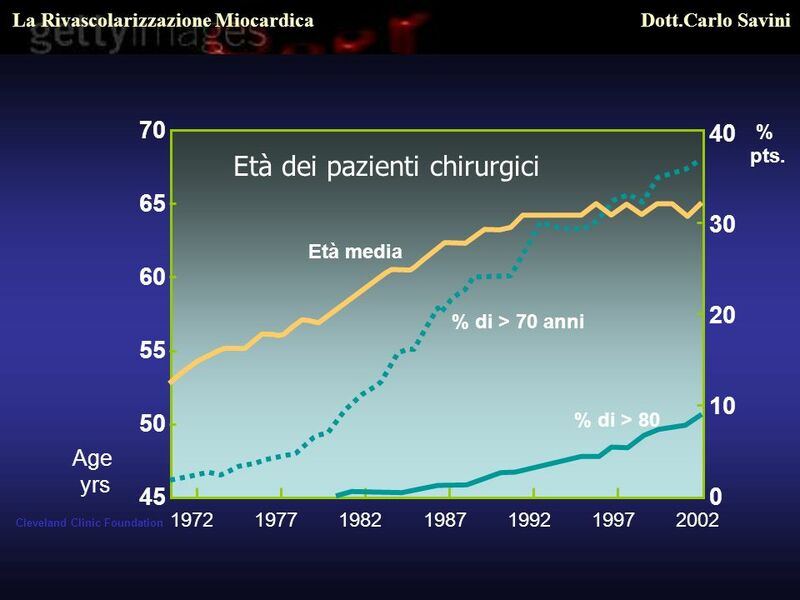 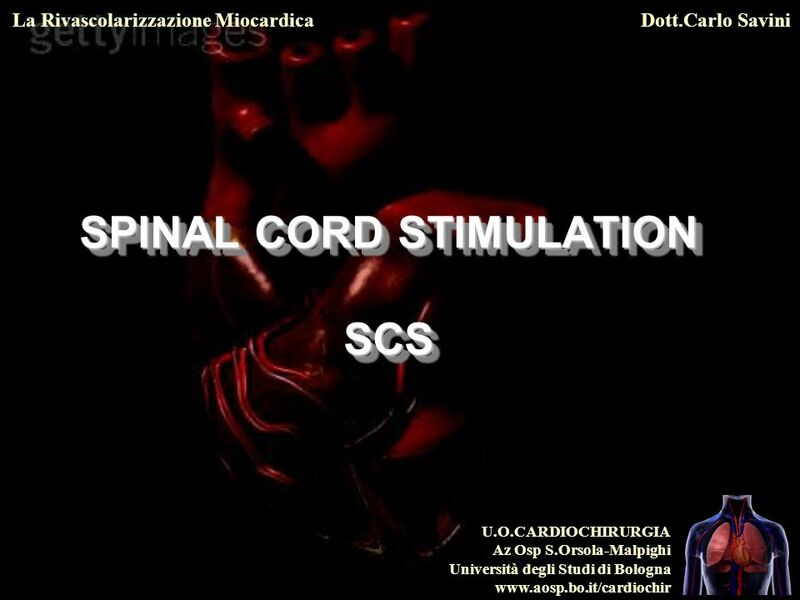 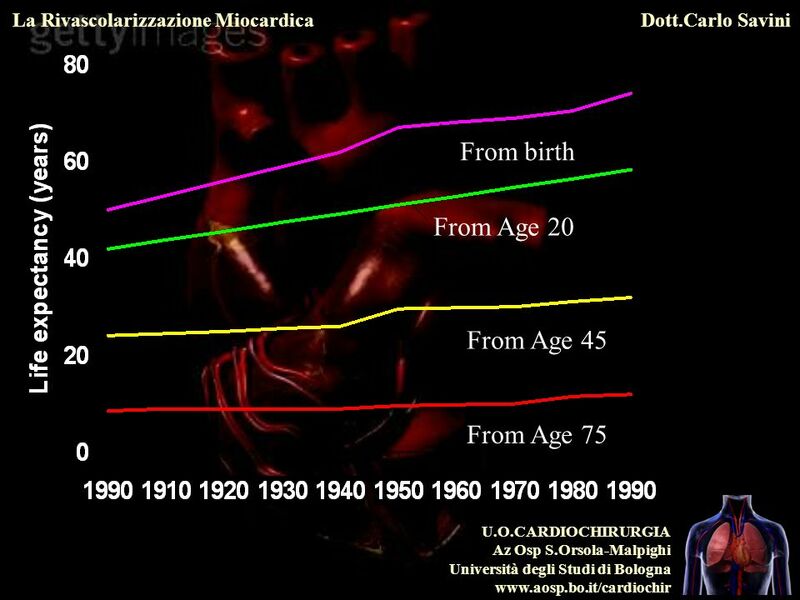 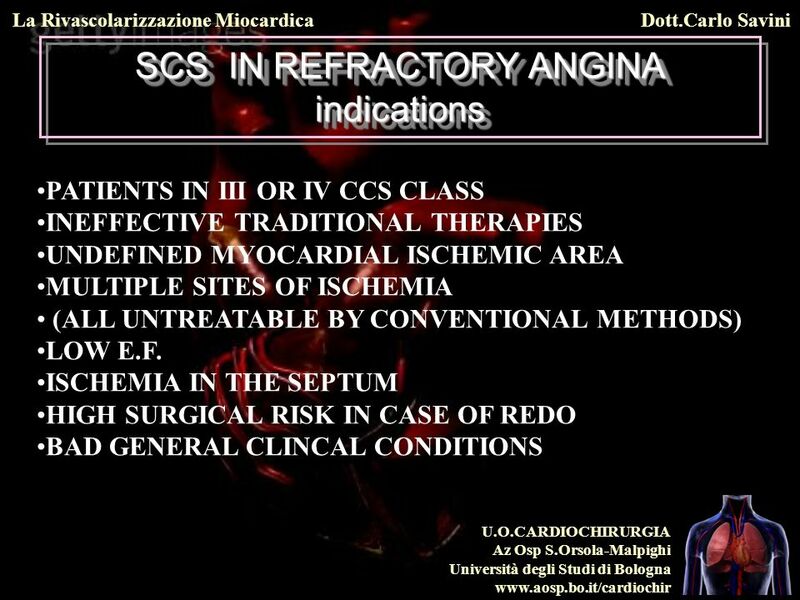 Scaricare ppt "La rivascolarizzazione Miocardica"
La PTCA dopo fibrinolisi: precoce o rescue ?